Although the test can be used to detect defects caused by various medical conditions such as stroke, brain tumors or other neurological deficits, it is most frequently used in eye care practices to diagnose, monitor or rule out glaucoma. The visual field test is carried out by a computerized machine, called a Humphrey™ Field Analyzer, but other systems are currently used as well. The results are printed out and the doctor discusses the results with you. Occasionally, the test has to be repeated when results are uncertain. The test primarily measures the quality and quantity of peripheral or "side" vision you have. It is a straightforward and painless test which does not involve eye drops. Essentially, lights are flashed on and you have to press a button whenever you see the light. Your head is kept still on a chin rest. The lights are bright or dim at different stages of the test. Some of the flashes are to check if you are concentrating. Each eye is tested separately and the entire test takes less than 20 minutes. Digital photography has revolutionized the camera industry and it has also revolutionized healthcare. Digital Retinal Imaging is a process in which a high-resolution digital photograph is taken of the back interior portion of your eye called the retina. In most cases, the digital color image can be obtained without dilating your pupils. The image produced shows the optic nerve, blood vessels, nerve fiber layer and the macula, which is the most sensitive part of the retina and is responsible for the most clear and detailed vision you have. The imaging can show abnormalities like tumors, hypertension, macular degeneration and diabetic retinopathy that may threaten normal vision. It also provides invaluable baseline information to assist your doctor in determining if any changes in the health of your eye have occurred from one exam to the next. The digital imaging becomes part of your permanent record so that your doctor can closely monitor even the slightest progression of any abnormalities. You will be given the opportunity to see the images and get a thorough explanation of the images. Glaucoma treatment has changed dramatically over the past few years and one of the breakthrough instruments in the early detection of glaucoma is a device called the GDx by Carl Zeiss. The GDx uses a laser to take precise measurements of the optic nerve and surrounding tissue to detect even the most subtle damage from high fluid pressure inside the eye. The Zeiss GDx is a computerized laser scanner used to help diagnose glaucoma before any vision loss occurs. The Zeiss GDx exam actually lets your doctor see the pattern and thickness of the nerve fibers in the back of your eyes, then compares the results to normal values. If your nerve fibers are thinner than normal, this could indicate glaucoma long before any vision has been lost. As a result, your doctor will have more time to treat the disease. The test is a quick and comfortable and you don’t have to have your pupils dilated. You simply look into the Zeiss GDx system while it safely scans the back of your eye. Total exam time usually takes less than a minute, and the system creates easy-to-read color images that your doctor can quickly analyze. Probably one of the most amazing pieces of equipment we have is our Marco M3 machine. The M3 is the world's first and only pre-testing machine to incorporate three machines in one, hence then name M3. 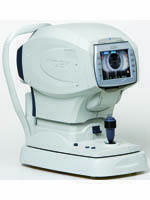 The M3 has a built in auto-refractor which a computer that uses infrared beams to help determine your eyeglass prescription, it has a built in auto-keratometer which measures the curvature of your corneas which is essential in fitting contact lenses and doing laser surgery and has a built-in tonometer which is the "puff of air" test that measures the pressure of fluid inside your eyes. Glaucoma is a disease where the eye pressure gets too high and may cause blindness. The good news for those who have had the air puff test before is that the M3 has a new softer, gentler puff. A pachometer is a medical device used to measure the thickness of the cornea. As part of our evaluation for glaucoma at Valentine Eye Care, we may use a device called the Sonogage Corneo-Gage Plus™ to obtain a painless computerized measurement of the thickness of the cornea. In combination with other testing, corneal pachymetry can help us determine whether or not you have glaucoma as the accuracy of eye pressure measurements can be influenced by corneal thickness. Pachymetry also has a number of other uses in comprehensive optometric care. It can be used in the screening of keratoconus, a progressive corneal condition and is extremely important in determining whether laser eye surgery such as LASIK is suitable for a patient. Pachymetry allows us to determine if a patient has enough corneal tissue to safely have laser surgery. Measuring corneal thickness with ultrasound is quick and easy. A numbing drop is placed in both eyes. A pen-sized probe is then used to briefly touch the surface of each eye. The Heidelberg HRT II Tomographer is an advanced diagnostic instrument used for precise observation and documentation of the optic nerve head, essential for the diagnosis and management of glaucoma. The HRT II uses a special laser to take 3-D photographs of the optic nerve and surrounding retina. There is no discomfort with the test, and it usually takes less than 15 minutes. The tomograph provides detailed 3-D information about the optic nerve head in the back of the eye. Optic nerve head changes may be one of the earliest signs of glaucoma. Since early detection is imperative for the preservation of vision, optic nerve head analysis is essential in the diagnosis and management of patients at risk for glaucoma. In patients at risk, this test is usually repeated annually to help the doctor assess if changes are occurring in the optic nerve head. 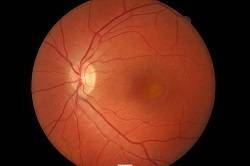 Changes in the optic nerve due to glaucoma almost always occur prior to any visual symptoms the patient may experience. In the early stages of glaucoma there are no symptoms. Gradually, if left untreated, glaucoma causes the optic nerve to become damaged resulting in a loss of vision. The key to controlling glaucoma is catching it early. The best way to prevent vision loss from glaucoma is to know your risk factors and to have an eye examination at appropriate intervals. Obviously, it is our goal to prevent patients from ever losing vision from glaucoma. 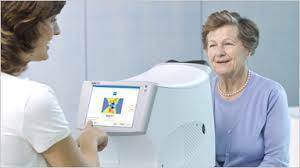 Therefore, testing with the Heidelberg HRT II Tomographer will be performed when indicated as an aid in the detection of glaucoma.